The food processing industry has very stringent rules and regulations, and for obviously good reasons. This is why it’s so important that your food manufacturing parts and machinery are made with food-grade material. Cast nylon plastics are commonly used in conveying, packaging, bottling, and canning machinery parts and are ideal for scrolls, wear plates, chain guides, bushings, sprockets, dough forms/cutters, bumper blocks, wear strips, conveyors, pulleys and sheaves, and conveyor chains. Food-Safety comes first: We don’t think we need to sell you on this feature of cast nylon! All Nylatech cast nylons plastics are certified and tested for use in the food processing industry. Durability is key: When parts break or need replacing your entire production line often needs to be shut down. This wastes time and you lose money. When your parts are made from cast nylon, you get exceptional resistance to wear, abrasion, chemicals, and corrosion, which means their life-span is significantly longer than other materials. Strong but light: Often metal parts are quite heavy. Cast Nylon plastic parts are both extremely light weight and have high impact strength. Add to that their self-lubricating properties and you have a clear winner. 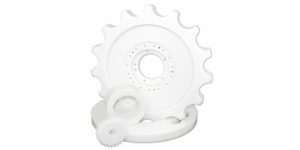 Nylatech Natural is one of the most popular food-grade cast nylon plastics we carry. Learn more about this plastic or contact us and we can recommend the best cast nylon plastic for your food processing application.